“I have loved creating fabric all my life. At Radcliffe College I majored in Visual and Environmental Studies and then went on to medical school and my ongoing career as a practicing psychiatrist. Meanwhile I began making quilts in 1975, and over the years I have created many quilts by hand and machine for friends and family. In 1995 I developed a Sunday school curriculum using quilt Bible blocks. The result was a quilt that I made from fabrics chosen by the students. I organized a group of church members, aged 20 to 80, to meet regularly to do the hand quilting. Our conversations covered topics from antimacassars to ‘Angels in America.’ The quilt is on permanent display at the Wellesley Hills Congregational Church, and sales of notecards picturing the quilt provide funds for the church’s outreach programs. The idea of coding DNA sequences in quilts, i.e. genome quilts, came to me in November 2001 during a weekend when I saw an exhibit of the work of Anni Albers and attended a lecture on the Human Genome Project. I realized that I could use simple quilt blocks to encode the base sequences of DNA. The resulting quilts are visually exciting and carry the deeper meaning of the code for the particular gene being represented. 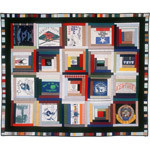 Over the years I have made quilts to celebrate births, weddings, and graduations. Taking this concept a step further, I have begun making quilts that incorporate fabric signed by the attendees at a celebration such as a wedding. I have also made baby quilts out of maternity clothes and a log cabin variation with my son’s favorite t-shirts.